Not everybody is ready to have a baby and while most people view this in terms of physical and emotional maturity, there is also a need to look at parenthood from a financial point of view. Today, the financial cost of having a baby is something that may well cause some young couples to think twice. It is also one of the main reasons why many women put off having a baby for later. Not everybody is ready to have a baby and while most people view this in terms of physical and emotional maturity, there is also a need to look at parenthood from a financial point of view. Today, the financial cost of having a baby is something that may well cause some young couples to think twice. It is also one of the main reasons why many women put off having a baby for later. While most of the cost of having a baby is upfront, there are also several hidden costs which may not seem very apparent immediately but can be a lot when they are added to the upfront cost. In fact the cost doesn’t decrease as your baby grows. These costs will keep increasing and piling as your baby grows and becomes an adult. However, if you are planning to have a baby, you just have to worry about the initial costs of the babyhood. Here’s a breakdown of what costs you should expect to incur. Raising a baby can stretch your budget a little and so it is important to keep a track of your baby-related expenditure. Several baby expenses such as a crib, stroller, and infant car seat are one-time investments and you will probably buy these items before your baby arrives. If you enjoy shopping for yourself, you will definitely love shopping for your unborn baby. You will probably be tempted to buy every cute piece of baby clothing and every baby gadget! Keep in mind that you also have to plan for recurrent baby expenses include infant formula, baby diapers, and healthcare products. Find out the monthly cost of a baby, so that you can create a personalized baby budget as this will this will help you to plan your finances. A monthly baby expense calculator will take into account the cost of basic necessities like formula, diapers, child care, baby clothes, baby food and, baby toys and paraphernalia. Couples sometime want to know the monthly cost of a baby before they try to conceive. It is not always easy to anticipate the needs of a new born and so it would be advisable to go through a checklist for pregnant mothers. These lists would be able to provide you with a general view of all the products you will need to purchase before the arrival of your child. You will also need to calculate the average monthly cost of a baby and while this is generally a stable figure, you need to make allowances for doctors’ visits and medications. If you have health insurance, you may not have to worry about most of the medical expenditures. For a normal vaginal delivery, today the medical bill can be anywhere between $5,000 to $10,000 US Dollars. However, if there is the need for a C-section, you can easily add about $2,000 to the existing bill. On top of that, there will be expenses for ultrasounds, medicines, and other miscellaneous charges that the hospitals levy. If you have a premature delivery, the costs may run uphill. The cost of stay and the medical intervention during any health problems or complications can run up to $200,000. If you are taking time off from work to have a baby, you have to add the loss of income to your expenditure. Most women take about three months of leave to take care of their child. When you calculate the baby cost monthly, the expenditure on diapers and formula will be on top of the list. An infant can use up about three to four hundred diapers a month. Formula and milk costs can also run up to $150 per month. You can keep a diary so that you can keep an account of the average baby cost monthly as this will help you to plan your finances. To calculate the average baby cost, monthly expenditure on visits to the doctor and immunization should also be added. You can create your own baby cost calculator to keep a tab on your baby monthly expenditure, as this will also help you to plan outings and vacations. Diaper costs also form a large part of regular baby expenses. The average monthly costs of diapers can range from $ 30 to about $85 for disposable diapers. An average baby will go through approximately 7 to 12 diapers in a day. Some ways to cut down on the costs of these diapers is to use cloth diapers and try washing them at home. This option actually also turns out to be environmentally friendly. Another major contributor to monthly baby expenses is the cost of child care which can work out to as much as $ 1000 per month. 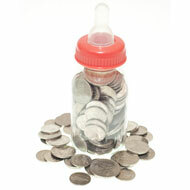 New born baby expenses also rise because of all the baby gear that one can not seem to do without these days. Items like car seats, high chairs, and linen can amount to $ 100 per month and maybe even more depending on the brand you choose. Besides these accessories, some of the other frequently desired and used equipments include a play gym, a feeding table, a baby tub and a toddler tub, a baby potty and a training seat but all of these can be purchased according to your requirements. Clothes alone can raise the expenses on any baby list. These can range anywhere from 20 $ in a month to about 50 $. For the first few months, you will need swaddling clothes, but later on baby clothes will include rompers, body suits, vests and warm wear. Many first time parents tend to save on the costs of clothes because of the quantity they may receive in the form of presents. Some other desirables which are also necessary for the development of one’s child include toys, books, DVDs and CDs. These costs can range from $ 20 in a month to about $ 40. When making a baby budget, your list of baby expenses should be comprehensive and go over it a couple of times to make sure that you have not overlooked any expenses. Baby food costs can vary greatly depending on whether you depend solely on breast milk for the first few months or if you supplement breast milk with infant formula. Baby food prices also vary according to the type of formula as well as the brand. The average monthly cost of a baby being fed on formula milk can range anywhere from $60 to about $100 per month. Thus baby food costs can rise exponentially once the mother stops nursing the child and start using formulas and other packaged food products that are available in the market. A simple way to bring down this rising cost is to nurse the baby for longer or to switch to feeding the child easily available foods like fruits and vegetables. However you should always make sure that you only make changes to your baby’s diet with approval of the doctor or pediatrician. Baby food prices keep increasing because of the demand for the products which are hygienically packed and which match the requirements of the child’s needs. Baby organic foods that are packaged and easily available can prove to be very expensive and can possibly top the baby food expenses list. Another big contributor to baby costs is medical care, ultrasounds, and prenatal visits. Childbirth in a reputed hospital alone can work up a bill in the range of $ 5000 to about $ 10,000. If you require a C-section then this can raise the costs by an additional $ 2000. Babies born prematurely can raise the expenses by a few thousands too. There are also newborn baby expenses such as booster shots, vaccines, and inoculations which contribute significantly to expenses. Once the children start day care they are additionally more prone to falling sick. It is also important to find out the details of your company’s maternity leave policy.